In the descriptive letterpress which accompanies 'The Broken Saucer,' Graham Balfour comments on J B B Wellington's success in using children as the subject matter for his photographic studies. 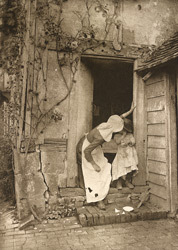 "'The Broken Saucer' represents another Sussex scene, a doorway in Horsted Keynes, not far from Cuckfield. It was the result of a sudden inspiration: the woman and child were obtained as models; the idea came at that terrible moment when, to most of us, it is so perversely reluctant: the child at once put up its hand in the right way, and the thing was done."